Imagine you’re on your honeymoon in Las Vegas, chilling in your swanky hotel room while your spouse is taking a shower. While checking out the minibar, you come across a $5 gaming chip in one of the drawers – the previous occupant must have mistakenly left it there. You take the $5 chip and head downstairs to the roulette tables, where you bet it on your favorite number: 25. To your surprise, the ball lands on 25 and the dealer hands you $175. You decide to let your winnings ride by betting it on 25 again. Once again, the ball lands on 25 and your stash grows to $6,125. Taking this as a good sign, you bet it again and win, netting you $214,375. You’re on a roll! You’re still in luck in the next round, which gives you $7.5 million dollars, more than what most people will ever earn in a lifetime. You bet it all on 25 again and amazingly, you now have $262 million, which makes you richer than Mitt Romney. You decide to try your luck one last time. If it works, you’d be worth almost ten BILLION dollars. Sadly, this time the ball plops onto the number “00” with a sickening thud, and you lose all your winnings. You walk back to your hotel room and tell your spouse you were playing roulette downstairs. Your spouse asks how you did. Sooooo…. What does a botched up roulette game have in common with Chinese New Year? For most of us here in Singapore, Chinese New Year involves a helluva lot of eating, answering awkward questions about why you’re not married, and… gambling. This year, I found myself wondering why Chinese New Year was such a popular time for gambling. Most of the time, I scoff at the hordes of people who frequent casinos and throw their hard-earned savings away. But whenever Chinese New Year rolls around, I find myself stumbling to blackjack games like a delirious addict on too much bak kwa. After pondering over this curious dilemma for a couple of days, I had my conclusion: The culprit was the innocuous little ang bao. Psychologically, receiving an ang bao has exactly the same effect as finding a $5 chip in your Las Vegas hotel room. Namely, they’re both “found” money, which inflicts this interesting psychological effect on you known as mental accounting. Nope, mental accounting has absolutely nothing to do with your ability to multiply 17 x 32 in your head. Instead, it’s a psychological phenomenon that causes you to treat money differently depending on where it comes from, where it is kept, or how it is spent. So mental accounting posits that you’d treat $100 from an ang bao very differently from $100 you’ve worked hard to earn. Mental accounting causes you to spend $500 in your vacation allowance way more freely than you would for the same $500 in your savings account. But mental accounting has a dark side too. It causes you to be flippant when you’re dealing with “surprise” or “additional” money, like your bonuses, or your gambling gains. Ever find yourself winning a hand at poker, and then aggressively calling or raising in subsequent rounds? That’s mental accounting at work, and it could easily work against you. The strategy to prevent mental accounting from screwing with you is to set predefined systems, something I practice as much as possible. 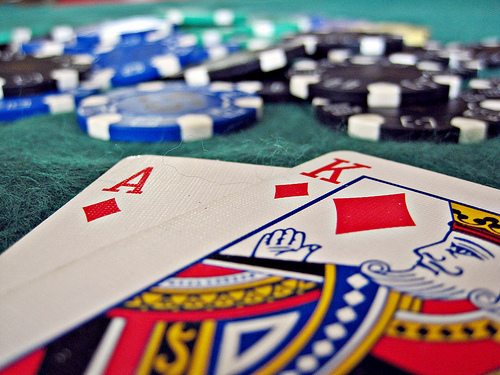 Go to all gambling games with two predefined rules: 1) a stop-loss and 2) a lock-in percentage. Most people are familiar with a stop-loss, which is a predefined amount you’d be fine with losing. But few people implement a lock-in percentage, which kicks in once you start winning. For example, if I set a lock-in percentage of 20%, I pocket 20 cents for every dollar I win and don’t touch it for the remainder of the night. These rules have helped me to save hundreds of dollars over the past few years. But the awesomeness of the lock-in percentage rule goes way beyond Chinese New Year blackjack games – Think about how you can apply it to your bonuses, allowances, inheritances, rewards, rebates, or any sort of “found” money you come across. For example, predefining a rule that states you’ll save 50% of your bonus will help you to save way more effectively than the average cubicle dweller who blows his entire bonus on dumb things to overcompensate for his sad, sad life. When applied right, predefined rules could potentially save you tens of thousands of dollars throughout your lifetime. Ask most people how they handle their personal finances, and they’d give you all sorts of tips and tactics like choosing the right credit cards or investing in some obscure growth stock. However, while we don’t think of it often, it’s interesting how psychology has such a disproportionate influence on our ability to hold on to and grow money. A mastery of a couple of psychological principles could be way more effective than hundreds of money tips and tactics. This entry was posted in psychology and tagged accounting, belsky, blackjack, blog, chinese, decisions, dumb, finance, finances, gamble, gambling, gary, gilovich, in, lionel, lock, lock-in, loss, make, mental, money, new, people, percentage, personal, psychology, roulette, segregation, singapore, singaporean, smart, snake, stop, stop-loss, systems, tactics, thomas, why, year, yeo by lioyeo. Bookmark the permalink. Hmm…interesting theory! I could see how it could be very true. Hope you don’t mind that I re-blog this on my agency’s, NICOS Chinese Health Coalition’s, Facebook page (Chinese Community Problem Gambling Project).